The countrywide celebrations marking the one-year countdown to the start of the Winter Olympics in Sochi were overshadowed Thursday by a high-profile dismissal at the Russian Olympic Committee. During a two-day inspection of Olympic construction sites, President Vladimir Putin fired the committee's deputy president, Akhmed Bilalov, because of skyrocketing construction costs and delays in completion of the Russkiye Gorki ski jump at the Krasnaya Ployana ski resort. The move followed Putin's visit to the construction site a day earlier, when he castigated Bilalov for the poor work. Analysts said the incident was a public dressing-down amid ongoing speculation about embezzlement and corruption during preparations for the games. A video of the president inspecting the construction work appeared online Wednesday. Bilalov, who is also president of Northern Caucasus Resorts, a state-owned company overseeing a project to develop that region as a tourist destination, will be dismissed from all his positions in line with Putin's order, Deputy Prime Minister Dmitry Kozak said at a news conference in Sochi. "The required instructions have been made. He'll be dismissed from those two positions," said Kozak, who oversees Olympic preparations. Kozak pointed out that Bilalov had taken on the task of financing the project, with part of the investment coming from Krasnaya Polyana Company, Russkiye Gorki's core investor, which was owned by Bilalov until Sberbank acquired control in May. "After an investor takes on an obligation to build an Olympic facility, it becomes an obligation by the Russian Federation to the International Olympic Committee," Kozak said, adding that failing to fulfill such obligations affects Russia's image negatively. 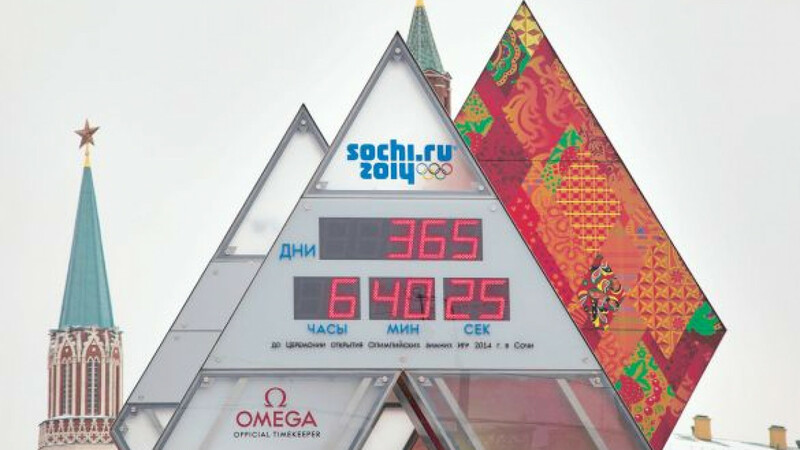 Russia celebrated the one-year countdown to the Olympics on Thursday by installing huge clocks in eight cities that count the days, hours, minutes and seconds before the event. The clocks were installed in Moscow, St. Petersburg, Yekaterinburg, Nizhny Novgorod, Novosibirsk, Rostov-on-Don, Pyatigorsk and Khabarovsk. A day earlier, Putin grilled the government and Russian Olympic Committee officials in his usual laconic manner about the reasons for delays. In the video on YouTube, the president doesn't seem to be well aware of Bilalov's status. "What is Mr. Bilalov doing now? Where does Bilalov work?" he asked. "It turns out that a deputy president of the country's Olympic Committee is dragging the construction down?" Putin said with indignation after figuring out that Bilalov had been in charge of the project. But the whole show might have been just for effect, since Bilalov is a well-known figure among the country's elites, and Putin was likely aware of his activities and business interests, said Yury Korgunyuk, an analyst for think tank INDEM. Putin was playing "a wise and fair leader," but he was acting for the camera after making Bilalov a scapegoat to show that the corruption fight is under way, Korgunyuk said. "That's the Russian way to eliminate corruption," he added. Bilalov, who hails from the republic of Dagestan, started his political career in 1999 as a deputy in the third State Duma representing the Edinstvo movement, which was subsequently reorganized into the ruling United Russia party. He also represented a United Russia faction in the fourth State Duma between 2003 and 2007 and was a Federation Council senator from the Krasnodar region in 2011 and 2012. Bilalov was appointed to the Russian Olympic Committee in 2010, the year he reportedly sold his stake in Krasnaya Polyana to his younger brother Magomed. But some media outlets said Akhmed Bilalov remained the company's beneficiary until last year, when Sberbank bought an additional share issue to increase its stake in the company from 25 percent to 50.03 percent. The country's biggest lender had invested approximately 2 billion rubles ($66 million) in the Russkiye Gorki complex in 2010 in exchange for a 25 percent stake. Completion of the complex was initially scheduled for June 2011, but the deadline was moved to July 2013 because the investor, Krasnaya Polyana, was dragging out the work, Kozak told Putin during Wednesday's inspection. He also said the construction cost had soared from 1.2 billion rubles in 2009 to 8 billion rubles, with part of the sum provided by state lenders. "Well done! You are doing a good job," Putin retorted ironically. Kozak said Bilalov was aware of the authorities' dissatisfaction with his work. "While he was participating in the project, I told him maybe a dozen times the same things the president said at the ski jump yesterday," Kozak said at the news conference Thursday, Interfax reported. He added that delays in completing the ski jump complex had been caused by mistakes during the preliminary investigation of the construction site because the peculiarities of the soil hadn't been taken into account. "I told him that the initial work on this site had been carried out as if it were done for an enemy, not for himself," the deputy prime minister said, referring to Bilalov. "Now a different shareholder, Sberbank, has to drive piles to keep this ski jump in place on the unstable soil of the slope." Kozak said formalities have yet to be finalized before Bilalov is dismissed officially. After the dismissal, Bilalov will be free to choose "any other place of work," Kozak said.